Last Saturday we drove with friends over to the west side of Osaka Bay to see the lights of Kobe. We intended to go see the luminarie, a display of lights commemorating the victims of the Kobe earthquake of 1995. We did see them from the highway, but instead, ended up at the water front, pictured above. There is a nice mall, Mosaic, with many restaurants, cafes, and stores. We had dinner at an Italian restaurant and then strolled along the pier to soak up the view. 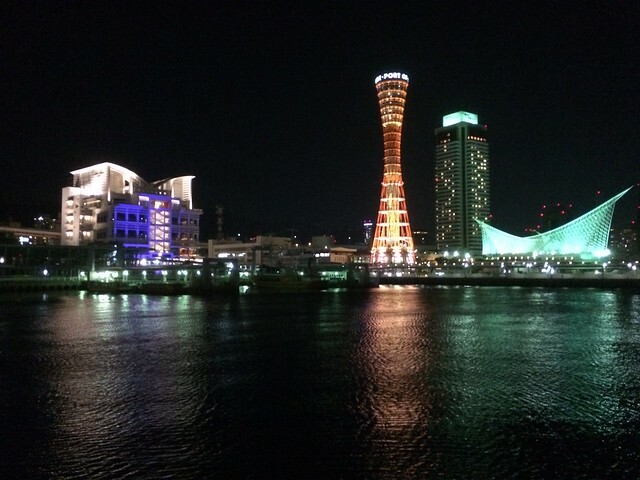 As you can see is the prominent, Kobe Port Tower. a 108-meter high tourist attraction built in 1963. To the right is a hotel and museum and further on is the port. Kobe historically was a port city and one of the few areas in Japan open to foreigners during their long period of isolation. The port dropped from the second busiest port in Japan to the fourth after the earthquake as it is today. We hope to see more of Kobe. 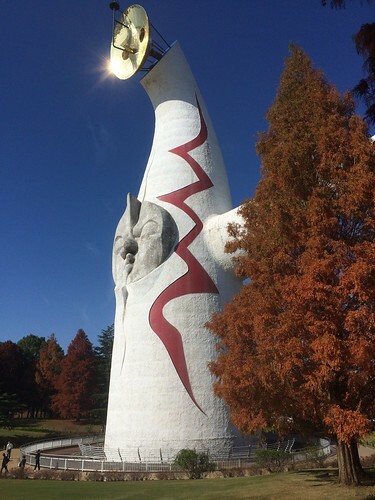 The other tower I wanted to highlight in the post is the Tower of Sun located in Expo Commemoration Park near our home in Mino. The park is on the site of a former world’s fair that took place in the summer of 1970. 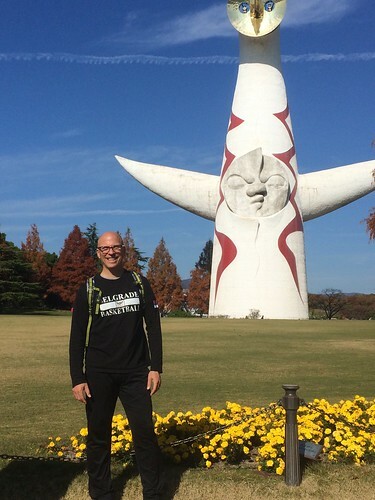 The tower was designed by Japanese artist Taro Okamoto. Two of the three original faces on the tower remain and represent the sun of past and future. The red lines represent thunder. In its over 40 years, it has been opened and closed and refurbished many times. At the time of the expo, it was encircled by a plaza building, but today it is long gone. The park is huge, although really crowded on weekends. We have been there a couple of times and it is a good place to run, ride bikes (outside only) and they hold distance runs there often.